Original Sheet Music with lyrics for 21 songs . . .1914 was a great year for the publishers of Tin Pan Alley. Here is the original sheet music to 21 well known popular songs including "By the Beautiful Sea", "The Aba Daba Honeymoon", and "A Little Bit of Heaven" ("Shure They Call It Ireland"). 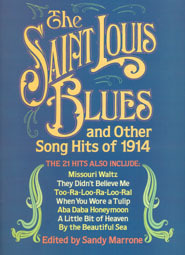 The original sheet music was loaned by Sandy Marrone, David A. Jasen, and the Sibley Music Library of the Eastman School of Music in Rochester, New York.